Built to contract 11804 for the Ministry of Supply, dated February 1955. Officially on Ministry of Supply charge from 09 November 1958 and delivered via Filton as G-APPE on 12 November 1958. On 13 March 1959 G-PE carried spare parts for the grounded BOAC 102 Britannia, G-ANBC at Rangoon, in what was then a record time for the route. Royal Air Force Transport Command colours were applied in late March 1959, serialled XN392 she was named ‘Acrux’. 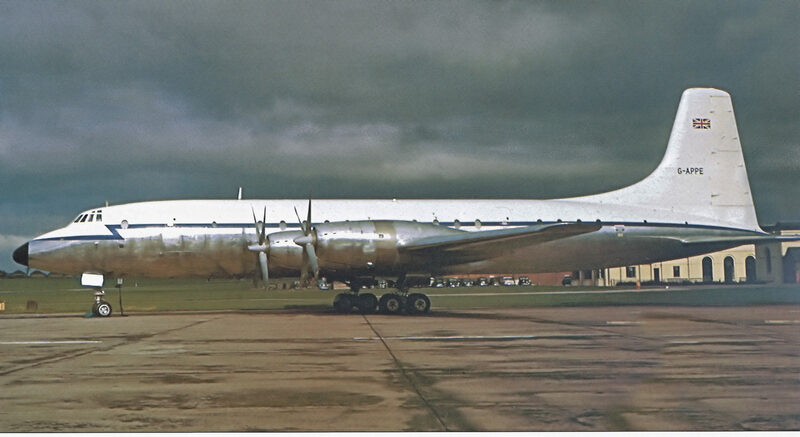 Evaluated by A&AEE at Boscombe Down until 24 May 1959, she was damaged by salt spray at Belfast causing her return to Filton for repairs to the underside of the fuselage and the wings. Delivered to Transport Command No.99 Squadron at RAF Lyneham on 18 September 1959 she was subsequently operated within Nos. 99 and 511 Squadrons’ Britannia pool at RAF Lyneham from March 1961. In December 1975 she was withdrawn from military service and stored at Baginton Airport , Coventry. XN392 had flown 12 652 hours and made 10 380 landings whilst in service with the RAF. She was purchased by Aer Turas on 18 December 1975 but only as a source for spares for their Britannia fleet and broken up and scrapped during April and May 1976 after a potential operation by City Airways fell through.